2 million people in the United States have aphasia, but 84.5% of Americans state that they’ve never heard the term aphasia. This fact needs to change immediately to pave the way for better communication experiences for people living with aphasia. Get ready because it’s time for Aphasia Awareness Month. The world has moved online, so we’re meeting the 84.5% in various social networks. Please help us spread a simple message about aphasia. First of all, if you’re strapped for time, you can click over and see our tweet. Hit the “retweet” button and the message will be sent to all of your followers. Either option gets the word out there, so encourage your friends and family to keep spreading the message. We need to get the words outside the aphasia community to that 84.5%. Our goal is to have the message reach at least 2 million people. Save this image to your computer and upload it to visually-oriented sites such as Instagram or Pinterest. In addition, researchers found that tweets paired with images get 150% more retweets. Feel free to use the image with your tweet or Facebook status update because we’re trying to get these words out there. Furthermore, we’re increasing our newsletter publishing schedule to every Thursday for the month of June, and we’ll be covering local aphasia events and programming. Plus we’re continuing with our weekly articles. Recently we wrote about aphasia making people feel invisible at parties, online speech therapy services, and a roundup of aphasia blogs. We’re covering a lot of interesting topics in the month of June including aphasia and the workplace, word games, and a new book that just came out about aphasia. Intensive Aphasia Program at North Memorial has a television program being prepared. The Adler Aphasia Center is hosting a breakfast for legislators to thank them for helping to create the Mike Adler Aphasia Task Force Law in New Jersey. The Aphasia Center of California’s 15th Annual “Walk to Talk” will be held on Saturday, June 24th at Lake Merritt in Oakland, California. Cowboy Aphasia Camp will be held June 5-9 at Oklahoma State University-Tulsa. Nova Scotia Aphasia Association will have banners up on the bridge from Dartmouth to Halifax, Nova Scotia. We’re only getting started, so there will be plenty of programming coverage on our site and newsletter this month. Welcome to Aphasia Awareness Month. 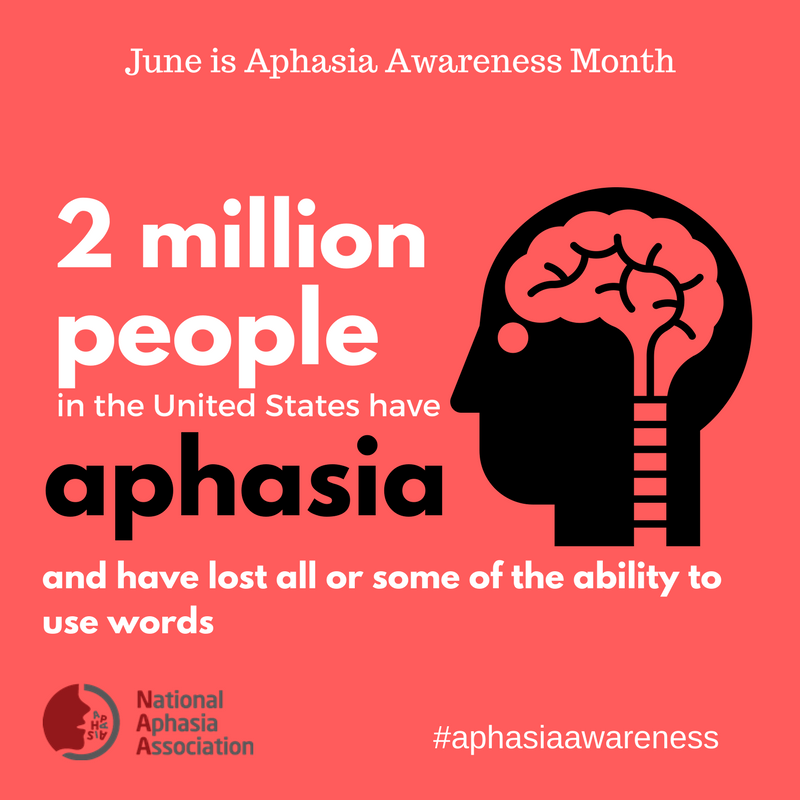 Spread the message and let’s increase the number of people who know about aphasia so we can generate more understanding in this world.